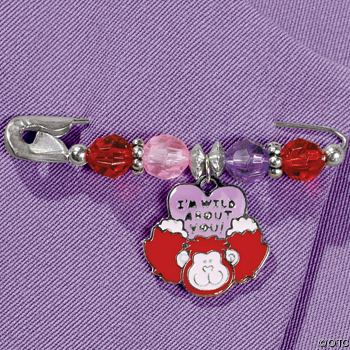 This Beaded Valentine Gorilla Charm Pin Craft Kit for kids will scream, "I'm Wild For You"! Use this cute pin making craft kit as a girl's party activity. Let each girl take her craft project home as a party favor. Smart Mom! Getting a great party arts and crafts project and saving money all at the same time. There is also a matching Gorilla Necklace Kit that's on sale. So you can supply double the fun at your daughter's Valentine Day or birthday party for kids. To see this kids craft project or some other fun arts and crafts ideas for kids, just click on the picture. I know how to make some really cute Gorilla fondant cupcake toppers to go along with this party craft. See our page on fondant, there's a link on our cupcake decorating ideas page. Pink Gorilla's and hearts can be the theme of this girls Valentine's Day party. Perfect for the parent who wants to say, Happy Birthday, I Love You! Holiday parties are a enjoyable change for kids. Usually it's the adults who get to celebrate on the different holidays of the year. This year why not throw your daughter (or son) a fun Valentine Day party and make sure you've ordered this cute Gorilla Valentine Day craft kit, the kids will love it!